Tag Archives for " major scale "
In the treble clef and bass clef lessons, you learned how to read and write the ‘white key notes’, the ones without sharps or flats; how to write sharps and flats in sheet music? How to write a sharp note in a staff? It’s really simple: just put the sharp sign (#) before the note. The notes in the first measure are: F# G A F#. So, the last note in the first measure is an F#, not an F. The notes in the second measure are: F G A F. The sharp sign from the first measure is not anymore valid in the second measure. The same rule applies to flat notes. The flat sign is only valid within the measure where it is used. If we want to cancel the flat sign for a certain note in the same measure, you can apply the same natural sign as with the sharp notes. You see that the melody has one flat note, the Bb. That’s normal, since F major has a flat note in its scale, the Bb! When I would display also the rest of the song, you would see even more B flats appear. Note that not only B’s that are on the 3rd line of the staff become Bb’s. All the B’s become Bb’s, so also this one. Sharps and flats that are displayed between the clef and the time signature, are called the key signature. Now, the same key signature also applies to E minor, since E minor is the relative minor of G major. So, every key signature can be used for a major key and its relative minor key. Please let us know if this lesson helped you in learning about sharps, flats and key signatures by leaving a comment below. The circle of fifths (also called cycle of fifths) gives us a handy overview of the different scales and how they are related to each other. In the lesson ‘How to form a major scale’, I explained that starting from the C major scale, every time we take a major scale a fifth higher, the scale gets one extra sharp note. And, starting from C major, every time we go a fifth down (or a fourth up, which is basically the same), we get one more flat note in the major scale. We could now display all the roots (starting notes) of the major scales in a row with C major (no sharps, no flats) in the middle. At the left of C, all the major scales with flats. Every step to the left would mean a fifth down (or a fourth up) and thus an extra flat note in the scale. At the right of C, all the major scales with sharps. Every step to the right would mean a fifth up (or a fourth down) and thus an extra sharp note in the scale. It is important to realize that the most left scale (Gb) and the most right scale (F#) are actually the same scale, since Gb and F# are the same note, only written differently: they are enharmonic equivalent. At the right side we have the major scales with sharps, on the left side the major scales with flats. Every step clockwise in this circle (this would correspond with a step to the right in our row above) means a fifth up (or a fourth down). And every step counterclockwise a fifth down (or a fourth up). 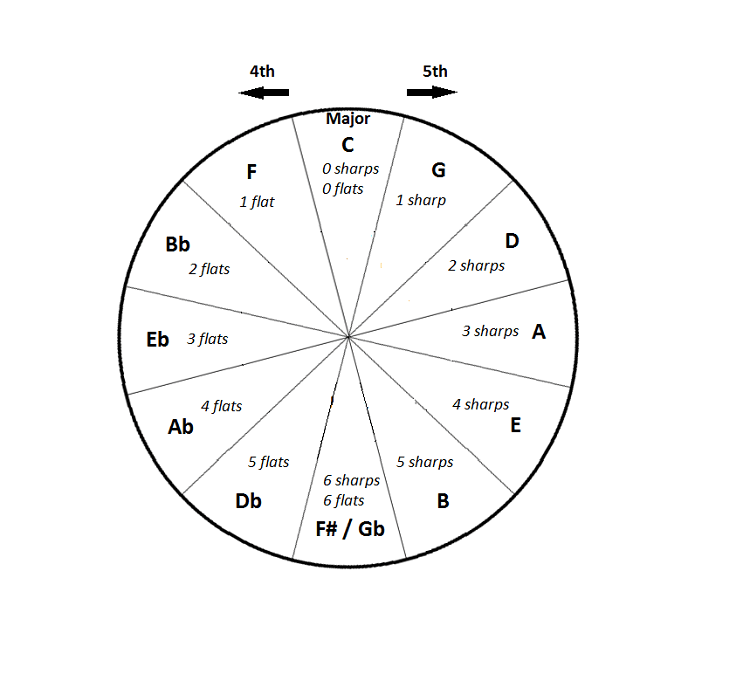 That’s why we call this circle the ‘circle (or cycle) of fifths’. Since a fifth up corresponds with a fourth down and vice versa, this circle is sometimes also called the ‘circle (or cycle) of fourths. 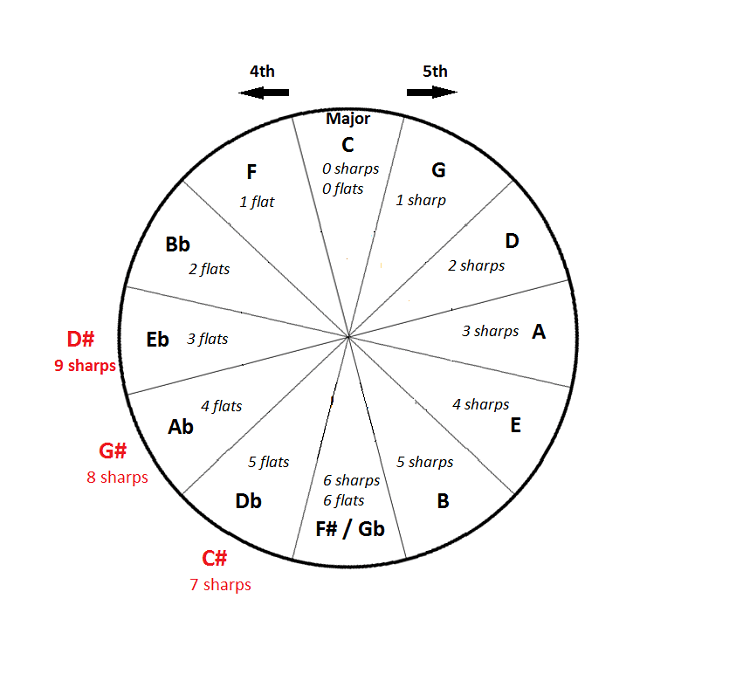 And see here our circle of fifths, which gives us a quick overview of the number of sharps and flats in every major and minor scale, plus an overview of relative minor/major relationships. Why would I need a circle of fifths? 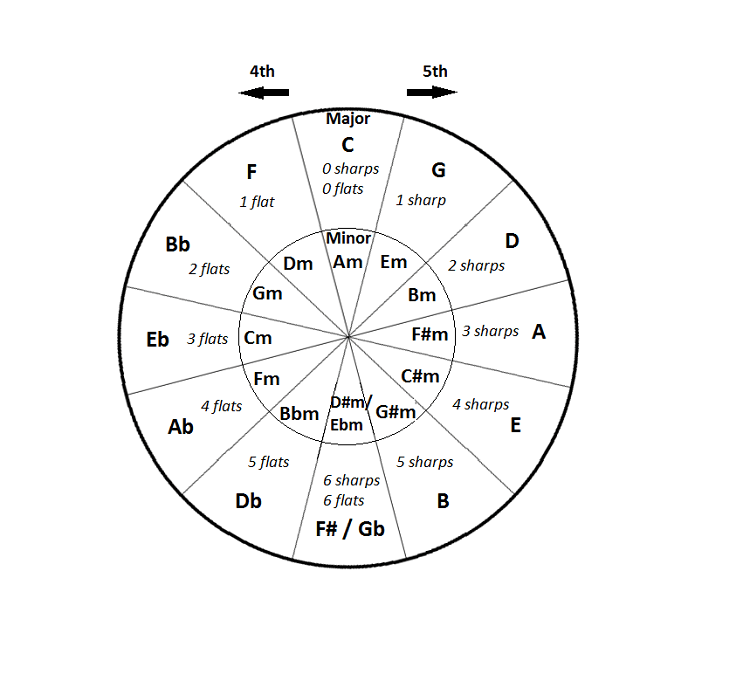 As mentioned above, the circle of fifths gives a good overview of sharps/flats and relative minor/major. The circle of fifths is among other things very handy for example in transposing a song (I’ll come back on this in a later lesson). 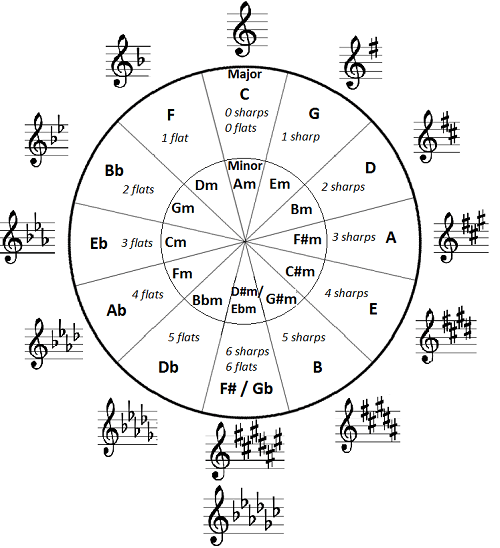 The circle of fifths also quickly shows us why the major scales that start on a black key on the piano are mostly written with flats instead of with sharps. Let me illustrate this with the Eb major scale, which has 3 flats. Eb is enharmonic equivalent with D#, so let’s look how the D# major scale looks like. First of all, in the circle of fifths, from F# I will go on clockwise to C#, G# and then to D# (so every step a fifth up). You can see that D# major has 9 sharps (wow!). As you can see: a total of 9 sharps (don’t count the D# twice)! For piano players, the C major scale is the easiest major scale because it starts on C and consists of all the white notes up to the next C. So, the notes of the C major scale are: C D E F G A B C (this looks as if the scale has 8 notes, but since the C is played twice, the scale consists of 7 different notes). Let’s apply our ‘formula’ (W W H W W W H) to find the scale of D major. In this case, the letter G is used twice (even if the first has a flat sign), so this is against our first rule. In the same way, you can show that you have to use C# instead of Db. Now, between E and Gb, there’s a ‘gap’ because we miss the letter F. We have therefore to use the letters in the order as they appear on the white keys of the piano keyboard. Did you notice that the scale of F major has a flat note (the Bb), not a sharp? It cannot be an A# (just apply one of the rules mentioned above and you will see that the 3rd note in the scale of F major is a Bb, not an A#). With our formula (WWHWWWH), you can now find out yourself the other major scales. Since there are 12 different notes, that means that there are also 12 major scales. When you do the scales in the order as listed below, you will see that each time you will get one more sharp in the scale. Starting from the C major scale (0 sharps), move on to the G major scale (1 sharp), then the D major scale (2 sharps, as you have already seen before), etcetera, till you reach the scale of F# (6 sharps). And don’t forget to apply one of the 2 rules (don’t repeat letters & don’t leave gaps). At the end of this lesson you will find the right solutions. Notice that in the list above, we go up a 5th in every step. So, starting with C major, every time you go up a 5th, the major scale gets one more sharp. When done, then go to the list of major scales with flats. Btw, instead of saying a 5th down, I could also have said a 4th up, this is explained in the lesson characteristics of intervals. You might have noticed that the two lists have together 14 items. That’s strange, because there are only 12 different notes, so also 12 different major scales. Well, as you can see, the C is repeated, so this eliminates already 1 item. When you look well at both lists, you can also see that the last item in list 1 is exactly the same as the last item in list 2: F# and Gb are enharmonic equivalent notes. So they are exactly the same note, only written differently. When you found the right notes for both major scales, you will see that they consist of exactly the same notes, but written as their enharmonic equivalents. Compare the F# major scale from the first table with the Gb major scale from the second table: both scales are exactly the same, the notes are only written differently. Note also the E#, which is enharmonic equivalent with F, and the Cb, the enharmonic equivalent of B.
It’s of very big importance to know well your major scales. It will help you with all the other music theory if you can quickly come up with the right scale in all the 12 different keys. For that purpose, it’s important to practice a lot. The exercise below is an excellent way to practice your major scales. I hope that you learned a lot in this lesson about major scales and that the exercise helped you to quickly master the scales in all 12 keys. Please tell us what you think of this lesson and the exercise by leaving a comment below. What are scales? How can you hear the difference between a major scale and a minor scale? Let’s start with the first question: what are scales? A scale is a set of notes (usually 7 different notes) that you can play in ascending order, descending order or in any other order. You can define a certain scale by the intervals between its consisting notes. As you will see later, the scale determines the mood of the music. As I said before, a scale sets the mood of the music. Below, you can listen to the C major scale played in ascending order over a C major chord. And now, here below, listen to the C (natural) minor scale played in ascending order over a C minor chord. Did you hear the difference? The major sound is much happier, the minor sound is more sad, tragic or melancholic. Notice that both scales start on a (low) C and end on a (high) C and consist of 7 different notes (you hear a sequence of 8 notes, but the C is played as the first and lowest note and as the last and highest note, so twice). So the only difference between both scales are the intervals between their consisting notes. I hope you liked this mini-lesson about the difference between major and minor harmony. Please tell us what you think of this lesson by leaving a comment below.